We are excited to welcome attendees to our 106th Annual Meeting, April 14-17, in Palm Beach Gardens, Florida. The CGA Annual Meeting is a once-a-year opportunity for you to network with other members, get updates on CGA activities, participate in your committee meetings, as well as attend committee meetings that you might not normally be able to attend. This coordination and communication is an essential part of CGA’s success representing the industry and developing safety standards. This year, the Annual Meeting program has been updated to ensure that attendees at all levels find value in the event and have an engaging, exciting, and educational experience. With the generous support of our Annual Meeting sponsors, we’ve added several new events including a young professionals reception, an industry panel discussion session, a recognition breakfast for our committee leaders, new optional activities, pop up giveaways, and more. Please use the expanding menus below to view additional information about the event. Please Note: As of March 12, 2019, the CGA room block at the PGA National Resort & Spa has sold out. Those planning to attend CGA’s Annual Meeting 2019 who have not yet made hotel reservations may call the resort directly at 844-821-0028. Additional reservations will be accommodated based on room availability; however, the CGA rate may not be available. If PGA National Resort & Spa is unable to accommodate your reservation request, see the Hotel Information section of this page for a list of nearby alternative hotels. Everyone attending meetings or events scheduled in conjunction with the Annual Meeting must register and pay the applicable registration fees and optional activity fees. A registration fee will be assessed if a person attends a committee meeting and does not register for the Annual Meeting. Please remember to RSVP through the CGA Member Portal for specific committee meetings you plan to attend. Please review all meeting and registration information prior to completing your registration. As you complete your registration, please indicate the meals and optional activities you plan to attend in order for CGA to accurately arrange for seating and food and beverage. Registration fees must be paid in full by credit card at the time of online registration. For payments by check or wire transfer, please print the registration form (PDF). Check must be made payable to Compressed Gas Association in U.S. dollars and drawn on a U.S. bank. Checks drawn on a non-U.S. bank will not be accepted. For wire transfers, contact CGA for current instructions. Hotel Reservations: Please note that CGA is no longer making the hotel reservations for the CGA Annual Meeting. Click here to make your hotel reservation, or go to the Hotel Information & Reservations to read more about the Annual Meeting facility. 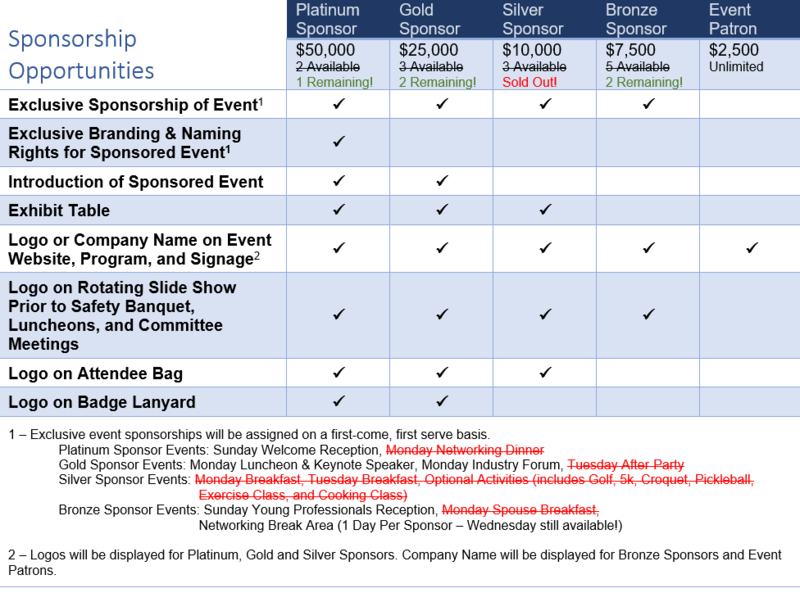 You may purchase tickets for others from your company who will only be attending the Safety Awards Banquet. The cost is $150 (USD) per person. Please contact Nancy Flower for information. A written cancellation is required regardless of whether a fee is paid or not. All registration cancellations, activity cancellations, and requests for refunds must be submitted in writing and received by CGA on or before April 1, 2019. Cancellations received by this date will receive a refund, less a $50 (USD) processing fee. No refunds will be made for cancellations received after this date. Refunds will be processed after the meeting. Room service available 6:00 am-11:00 pm daily. The CGA group rate is $255 single or double, and is subject to applicable taxes, currently 13%. A daily resort fee of $10 is applicable for all reservations and includes self-parking, high-speed internet access in all guest rooms, unlimited admission to the health and racquet club facilities (including bicycles and racquet ball), aerobics classes, tennis court times, 24 hour business center computer access and printing, and daily morning newspaper. Room bed types are not guaranteed. The hotel will assign room types at check-in. A guarantee will be required at the time of reservation for one night room and tax by credit card or check. If you need to cancel your reservation, you must notify the hotel at least seven (7) days prior to your scheduled arrival to receive a refund of the guarantee deposit. The hotel is approximately 12 miles (20 minutes) from the Palm Beach International Airport (PBI). The hotel does not provide airport transportation. Pre-registration for optional activities is required and applicable fees must be paid at time of registration. Availability is limited – sign up early to reserve your place at these exciting events! Spouses and significant others are welcome to participate in many of our optional activities. Jumpstart your day with a 5 Kilometer Fun Run/Walk! The event starts at the Sport & Racquet Club and runs through the surrounding neighborhood. The route will be clearly marked. Open to: All registered members, spouses/significant others, and guests. Price: $0 per person; includes a map of the course and water. Please check-in at the Pro Shop at least 15 minutes prior to the start time. The golf outing will be held on the Fazio course, par 72, 7,050 yards. An average score or handicap must be included on the registration form for each golfer. All foursomes will be assigned by CGA. Prizes will be awarded to each member of the first and second place teams, and winners of the two Closest to the Pin and one Most Accurate Drive contests. More information on game play and rules will be sent out to registered players prior to the outing. USGA Rules of Golf govern all play. Appropriate attire is appreciated on the golf course and practice areas: collared shirts, long pants or walking shorts are the norm. Unacceptable attire includes T-shirts, tank tops, athletic shorts, cut-offs, or jeans. Metal spikes are not allowed at the PGA National Resort & Spa. Everyone must have a set of clubs. Rental clubs are available at a cost of $85, plus tax. Please check the appropriate boxes on the registration form in order for CGA to send in your rental request. You are responsible for rental charges, which must be paid at the Pro Shop prior to play. Open to: All registered members, spouses/significant others, and guests; however, space is limited. Cost: $185 per person; covers greens fee and cart fees, bottled water, and a buffet lunch. Croquet is a game played on a lawn, in which colored wooden balls are driven through a series of wickets by means of mallets. Five tournament size croquet courts. Instructors will be available. Croquet players customarily wear all white apparel on court. More information on game play and rules will be sent out to registered players prior to the tournament. Open to: All registered members, spouses/significant others, and guests; however, space is limited to 24 attendees. Pickleball is a paddle sport that combines elements of badminton, tennis, and table tennis. Requires some knowledge of tennis, the pro can teach the rest. The resort has two pickleball courts. Congressman Joel Pritchard, Barney McCallum, and Bill Bell invented the game of pickleball one summer afternoon in 1965 on Bainbridge Island, Washington. More information on game play and rules will be sent out to registered players prior to the tournament. Open to: All registered members, spouses/significant others, and guests; however, space is limited to 20 attendees. Enjoy breakfast while reconnecting with friends and meeting new ones. Open to: Registered spouses/significant others only. A cardio jam session inspired by the infectious, energizing, and fun of playing the drums. Nostalgia … the music, the fashion, the movies. Come and enjoy the night. Dress in your finest 1980s outfit! Dust off your shoulder pads! Fer sure, like totally 80s! Cooking Class: Salsa & Margaritas! Fun and relax time spent making salsa, margaritas, and laughter … Who makes the best? The Nightcap Party has been an Annual Meeting tradition for many years. The event follows the Safety Awards Banquet and caps off the evening with networking and dessert. Thank you to our 2019 CGA Annual Meeting Sponsors! The CGA Annual Meeting is the largest technically-focused gathering of our industry’s subject matter experts. We anticipate approximately 250 attendees, including representation from every facet of the industry. This is your opportunity to market directly to an audience of influential industry leaders. There are several opportunities for your company to connect with Annual Meeting attendees. As a sponsor of the 2019 CGA Annual Meeting, you will support the critical work of CGA, create goodwill amongst CGA members, and increase awareness of your organization amongst attendees. Your organization will enjoy a number of benefits, including showcasing your products and services to potential clients, inclusion of your branding in meeting materials, and recognition at major meeting functions. With participants from all levels of leadership within the industry, your company will want to connect with our meeting attendees – the driving forces in the industry. To become a sponsor or learn more, please contact Sarah Saunders at +1 703-788-2724. Palm Beach International Airport (PBI) is the closest airport to the PGA National Resort and Spa, approximately 12 miles/20 minutes from the resort. Other airport options include Fort Lauderdale International Airport (FLL) which is approximately 29 miles/60 minutes from the resort; and the Miami International Airport (MIA) which is approximately 74 miles/90 minutes from the resort. The hotel does not provide airport transportation. Taxi fare from PBI to the PGA National Resort is between $44-50. Visit the airport websites for more information on ground transportation options, including car rental, taxis, shared rides, and other public transportation. The dress code for CGA committee meetings is business casual, coat and tie are optional. Dress for the Safety Awards Banquet is business formal; business suit, or coat and tie for men; business or cocktail dress for women. A sweater or jacket is recommended for outdoor evening events. Indoor meetings and events will be in air-conditioned meeting space, so it is recommended that you bring a jacket or sweater. Temperatures in the Palm Beaches in mid-April average a high of 82°F (28°C) and a low of 64°F (18°C). For information on things to do and places to see in the area, visit https://www.thepalmbeaches.com/.